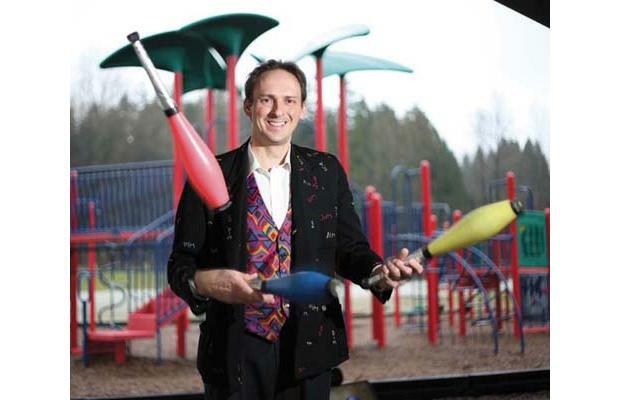 January’s Juggling Workshops | Damian Trasler's Secret Blog - Do Not Read! ← The Biggest question of all – WHY? On January the 24th I’m starting a new series of Circus Skills workshops. After the success of the kids workshops in November, I asked the Community Office at Stoney Creek to help me set up workshops for the local community. There’ll be six sessions, each an hour long and beginning at Seven pm. I’m able to accommodate a maximum of fourteen students, and will be teaching a range of skills. For absolute beginners, I’ll be teaching basic three ball juggling. This can take as little as ten minutes From there it’s a short hop to more three ball tricks – there are THOUSANDS of those – or on to four or five ball patterns. If you’ve got some experience with ball juggling, we can move on to club juggling. It takes a little more practice and technique but is very visually appealing. There’s also the opportunity to learn to pass clubs between two, three or four people. Exactly what you think they are – plates that spin! Easy to master, but getting them spinning is just the beginning. There are a number of tricks to get to grips with, as well as the challenge of balance and carrying multiple plates. These also have another name – Chinese Yo-yo. Unlike yo-yos, they aren’t attached to the string, which is good as the most popular trick with a diablo is throwing it high into the air. Since the library ceiling isn’t too high, we won’t be throwing them up much, but there are dozens of other tricks to learn on the way to diablo mastery. Developed by the Maori in New Zealand, poi are decorative and entrancing to watch. Two weights on lengths of string, they are swung in intersecting patterns but never tangle…Well, they SHOULD never tangle. Another perennial circus prop that many people wonder about, the unicycle isn’t as difficult as it looks. Once you’re in possession of the basic rules, all it takes is a little regular practice and you’ll be as comfortable on one wheel as you are on two. Just remember that freewheeling isn’t an option! This entry was posted in Uncategorized and tagged Burnaby, circus skills, Damian Trasler, Juggling, Stoney Creek School, workshops. Bookmark the permalink.